A final decision on the location for three hyper-acute units across Kent & Medway is expected to be made on February 14. The Joint Committee of Clinical Commissioning Groups will present the final decision making business case from the stroke review which has been underway since 2015. The proposed shortlist for the hyper-acute unit proposals were announced at the start of last year. The preferred option was confirmed in September as Darent Valley Hospital, Maidstone Hospital and William Harvey Hospital. General stroke services are provided in all the hospitals across Kent and Medway, including the QEQM, but there are currently no specialist hyper acute units. 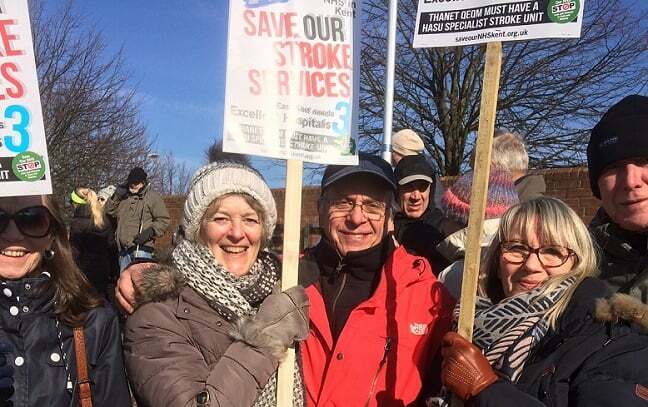 NHS bosses in the region say larger, specialist units in other parts of the country have been shown to improve outcomes for people who have had a stroke. The plan will mean the loss of emergency stroke services from Margate’s QEQM Hospital as well as at Medway and Tunbridge Wells hospitals. Thanet campaigners have been fighting the proposals, saying isle lives will be at risk because of journey times to Ashford. Members of Save Our NHS in Kent (SONIK) have consistently campaigned against the plans. Calls have been made by the group for the Kent and Medway NHS to look at the proposals again to include a fourth HASU unit at the QEQM. Some 5,000 responses were received during a consultation period, which ran from February to April 20,2018, which were analysed by DJS Research, an independent research consultancy. DJS said the majority of people who took part in the consultation agreed that hyper acute stoke units should be established in Kent and Medway. But the location of hyper acute stroke units, and travel times to the proposed units, were the key area of concern, with particular concern for people living in Thanet. Many felt the geography of the area meant that four units would be better in order to provide fair and equal access to all residents. 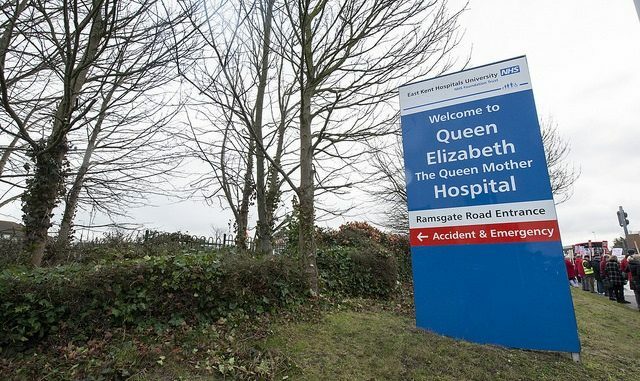 Many respondents in the CT postcode area – which includes Thanet -did not feel any of the options were suitable and said Kent and Canterbury Hospital or Queen Elizabeth the Queen Mother Hospital should be re-considered as part of the short-list. As part of the review, health professionals in Kent and Medway say they are now designing new stroke rehabilitation services, including hubs. Care will include rehabilitation therapy at home and in clinics as needed for up to six months; intensive rehabilitation at home three times a day, seven days a week; care in an inpatient rehabilitation unit for up to six months or care in a nursing or residential care home. Kent and Medway NHS says the new approach to rehabilitation must happen at the same time as the implementation of hyper-acute stroke units. 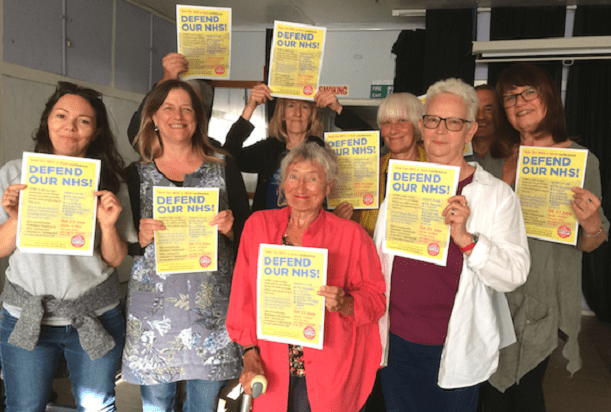 Save Our NHS in Kent are organising members of the public to attend a public meeting of health committee councillors held at County Hall on Friday, January 25 at 9.30am. Just like when the Post Offices made consultations public. Everyone said they didn’t want them taken away from their area but they did it anyway. Consultations are fake and a pure waste of money. The money they could have saved for the NHS by not consulting the public with this Stroke unit should have actually paid to include one at the QEQM! This is poor planning. The advert for a stroke on the tv is F.A.S.T, you have to act fast with a stroke, how is a hour plus journey to Ashford fast. As a former stroke rehab unit nurse,I am appalled by the decision to completely ignore our needs in Thanet at QEQM. I’m now retired after 42 years in the service and continually see through continued input and contact with the hospital,reduced front line staff including receptionits as well as nurses and doctors continually pushed to the limit. Also drastic financial reductions making things worse, also I’ve seen and experienced at first hand drastic cut-back’s and wastes of money. How long must Thanet and once great Britain going to put up with this? It feels like a deep pit that we cannot dig ourselves out fromore. As a former stroke rehab unit nurse, I am appalled by the decision to completely ignore our needs in Thanet at QEQM. I’m now retired after 42 years in the service and continually see,through continued input and contact with the hospital,reduced front line staff including receptionits as well as nurses and doctors,are continually pushed to the limit as well as portering and domestic staff whilst ward staff do their utmost to care for their patients. Drastic financial reductions make things worse, and I’ve seen and experienced at first hand drastic cut-backs and terrible wastes of money. How long must Thanet and once great Britain put up with this? It feels like a deep pit that we cannot dig ourselves out from. Why are we,the people,not considered or listened to? As a former stroke rehab unit nurse, I am appalled by the decision to completely ignore our needs in Thanet at QEQM. I’m now retired after 42 years in the service and continually see,through continued input and contact with the hospital,reduced front line staff including receptionists and clerical staff, as well as nurses and doctors,are continually pushed to the limit as well as portering and domestic staff whilst ward staff do their utmost to care for their patients. Drastic financial reductions make things worse, and I’ve seen and experienced at first hand drastic cut-backs and terrible wastes of money. How long must Thanet and once great Britain put up with this? It feels like a deep pit that we cannot dig ourselves out from. Why are we,the people,not considered or listened to? The Tories are actively killing off the people of Thanet – this is social cleansing and criminal in intent but not, yet, illegal. If you have a modest or low income you are now going to be deprived of a health service that you have been paying for all your lives through National Insurance. If this decision goes through on St Valentine’s Day, the future for a thriving Thanet will be over. Oh, and what’s Craig MacKinlay going to do about it? Most of our GP’s appear to be rolling over and doing what they are told by the CEO of NHS England – Simon Stevens paid nearly 200,000 quid a year to be a ruthless capitalist sociopath! It has always puzzled me how a low income, run down area like thanet is a Tory stronghold , it doesn’t make sense. Once again the Thanet Clinical Commissioning Group have shown they couldn’t give a flying damn about people in Thanet, they are only interested in protecting themselves as career bureaucrats, especially Caroline Selkirk, the Managing Director, and the so called Lay Chairman of the Committee, Clive Hart! Keep counting the beans you lot! Outrageous. Thanet CCG is unfit for purpose at the best of time. EKUFHT seems to be,too. We need this sorted. Margate is now a Labour strong hold but Thanet north also includes Herne Bay . I have a hunch that given Roger Gale supporting the closure of the stoke unit and universal credits, the slashing of the buses and wanting to abolish universal bos passes for the elderly, with a good candidate we could be the next Canterbury?